Collective bargaining – and beyond? Social security: Which way forward? Prof. Alain Supiot – What International Social Justice in the Twenty-First Century? Workshop: What’s new in labour law? 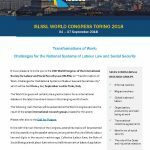 Round Table: What future for statutory regulation in the field of labour law?